Note: player is Flash-based & takes a moment to load. 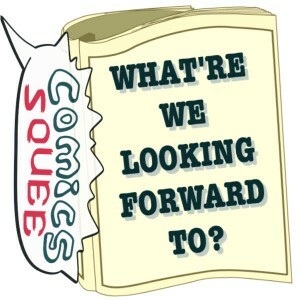 Welcome, lovely listeners and Precious Patrons of Pulp Pamphlet Parlay, to Issue 39 of Comics Squee. Each podcast our panelists, mighty robots loved by all and feared by evil, discuss the comic books, graphic novels, and general sequential art geekery that excites them. Our superpowers are tangents and tentacles. In this issue of Comics Squee we have: adventures with the Vigilante, a toilet dwelling medusa, some manga favorites, and a catty PI. 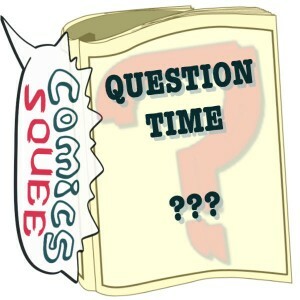 Vertical Strip style webcomic that’s been collected into bound books for each ‘season’ of the strip. Chriss backed the third Season/volume on Kickstarter. This fun story is about a guy who comes home one day to find a little medusa girl living in his toilet. She swum up from the fantasy world she lives in on a dare from chain smoking mean-girl mermaids. They have cute, fun our-world adventures and eat chocodilles before the story gets heavier when after Medusa’s mom sends a unicorn with a chainsaw horn to bring her home. We really like the design and style of this comic. April loves how the word bubbles’ shape. The printing on the books is nice and good quality and the thrid volume has fold outs almost as long as Chriss is tall. 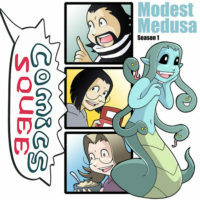 You can read it online at www.modestmedusa.com. 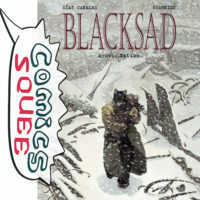 This is a comic by Spanish creators, from a French publisher, translated into English. The art is super great. We were all tempted to stop podcasting and just read the book. The motion and movement. There’s not a missed point at all. It’s very popular in Europe. 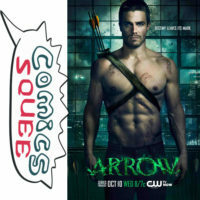 This is the CW show based on Green Arrow of DC comics. John really love the evolution of the characters around Oliver Queen. The story is about Oliver Queen comes back and his father’s done bad things, which is why his ship had sunk, and Oliver comes back to get revenge/fit those wrongs. It’s a reinvented CW version, not following anything strictly from DC. They’ve created characters, like Felicity Smoak, who’ve become so popular they’ve been brought into the comics. It’s a fantastic television show and John and our guest Katherine have been enjoying watching it. And everyone on the show is ridiculously good looking. (yes, there are indeed abs for days). This is a sweet, innocent managa about a highchool girl who meets a boy one day proclaims that she is a santa clause and he’s her reindeer. She’s got some kind of intuition about who needs help and who deserves kindness. And he can turn into a reindeer and fly when she commands him to. And his whole family are magical reindeer people looking for their santa clauses. Katherine really loves Tskuba’s art. She has everything that’s good about shoujo manga. She uses blank space really effectively. Chriss actually bought this manga after Katherine recommended it to her last Read Comics in Public Day. The Tick, of course. Going the other way, she’s heard good things about continuation of Buffy. The Batman animated series in the ’90s. Ultimate Spiderman. Fantastic Four: World’s Greatest Heros. The Witch horror movie and seeing Wonder Woman in Batman versus Superman mobie. The next installment of the relaunched Archie by Mark Wade and Fiona Staples.